Is there anything more inviting than the aroma coming from a freshly baked bread? If you love making homemade bread, one of the challenges you may face is determining the best loaf pan to get. In this review, we’ll go through the best loaf pans on the market. These loaf pans are guaranteed to leave you with delicious bread. Check the make of the pan. 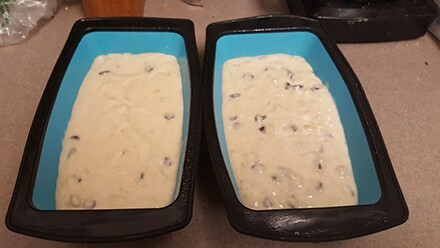 Ideally, you want a loaf pan made of a material that is durable and non-stick. The best materials used to make loaf pans are aluminum, steel, ceramic and cast iron. Steel boasts of exceptional strength, ceramic pans are quite versatile and cast iron is ideal for slow baking. Finally, aluminum is lightweight, durable and nonstick. All of these materials allow for even heat distribution. You should be able to get the loaf out of the pan easily without it sticking to the surface. Get a pan with large and comfortable handles. If possible, the pan should have silicone grips. Check the size of the pan. Here, consider your specific needs and baking style. If you need flexibility while baking, go for a set of small pans. Which is the Best Bread Pan to Choose? You should choose a loaf pan based on your needs. Moreover, the pan should meet the following requirements. It should have a nonstick surface so that you don’t have to use a tool to separate the bread from the walls. It should allow even heat distribution so that the loaf is properly baked from all sides. Modern pans bake bread evenly and release them easily. The pans are also strong and durable. In terms of size, most bread pans are designed for the needs of the average family when it comes to size. Read the loaf pan reviews below for our recommendations of the top rated bread pans on the market. 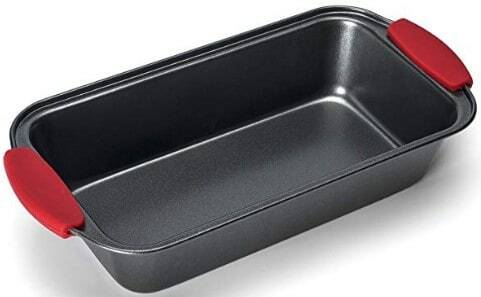 Measuring 8.5 x 4.5 x 2.75 inches, the USA Pan Bakeware is ideal for making loaves of bread that are big enough to feed the whole family for one meal. The model comes from an American manufacturer with a history of making quality kitchenware. Aluminized steel – This material is strong and distributes heat evenly to ensure the loaf is properly baked. 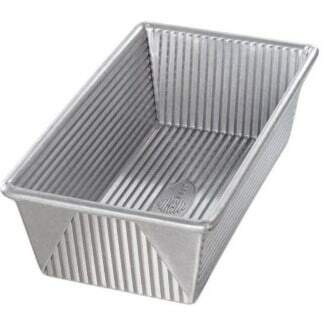 Corrugated surface – This allows for perfectly even baking and improves the non-stick properties of the pan. Americoat Plus nonstick coating – The coating makes it easy to release the baked loaf of bread. The material is BPA-free. This Elite Bakeware set of 3 pans are of the same size – 11.5 x 6 x 2.5 inches. You can use one of the pans to prepare a single loaf for a family meal or all three when you are entertaining guests. Heavy-duty steel make – Is durable and allows for even baking. Silicone handles with rounded ends – They make it easy to hold the pan when removing it from the oven. Nonstick coating – Makes it easy to remove the baked loaf from the pan. The unique thing about these Maxi Nature Kitchenware pans is that they have a thick silicone make. The material is strong, doesn’t bend or warp and is odorless. Each pan measures 9.5 x 5.7 x 2.7 inches and the material used to make them is completely safe. Rounded handles – They make handling the pans quite easy. Baking brush – It helps you get the perfect crust. Homemade bread recipe book – Has dozens of recipes for you to try. The Rachael Ray Oven Lovin’ Pan Set includes a pan and a perforated tray. You can take the tray out and allow all the fat to drain before serving the meatloaf. The pan measures 12.5 x 6.5 x 3.5 inches, which is large enough to make bread for the whole family. Wide handle – Offers a super comfortable grip. Silicone grips – They make it easy to remove the hot pan from the oven. Should not be washed in the dishwasher. Getting the meatloaf out requires the careful and skillful use of a spatula. 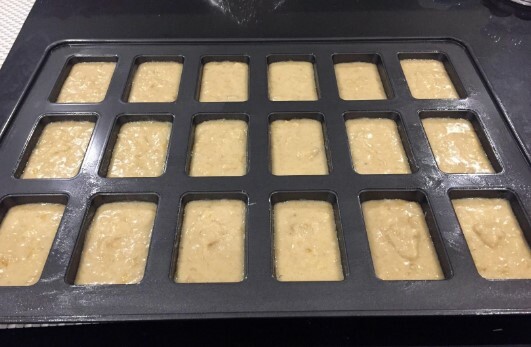 You can make 18 small loaves at once with the Wilton mini loaf pan. The pan measures 15 x 21 inches and is great for preparing special meals for the whole family or guests. The Nordic Ware Cake Pan has 6 cavities and measures 14.88 x 8.88 x 1.75 inches. 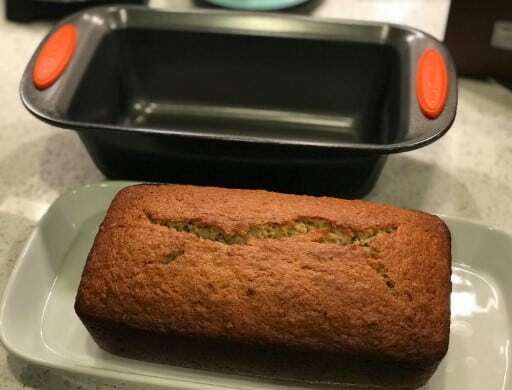 The pan is made by one of the top bakeware manufacturers in the USA – Nordic Ware – and is just right for baking delicious cakes for the family. Cast aluminum make – Aluminum is the best metal for baking pans as it distributes the heat evenly and prevents the dough from sticking. Uniquely shaped cups – They are absolutely beautiful. The Good Cook loaf pan is standard in size and so, would work for every home kitchen. The pan is quite versatile and can be used to make cakes or cook. Ceramic make – For perfect heat distribution. Rounded handles – They are super convenient. Classic design – The dish looks awesome. The dish must come to room temperature before you place it in the oven. The Lodge Cast Iron Mini Cake Pan has 7 cavities with 3.25 inches diameter. With the pan, you can make sufficiently big biscuits, bread and mini pizzas. The diameter of the pan is 11.25 inches and so, it’s easy to fit in the average oven. Cast iron make – This results in slow and even baking. This is one of the best cast iron bread pans on the market. Rounded handles – Provide an extra firm grip. Comes seasoned with a vegetable oil formula – You can start using it straight away. When you have a loaf pan at home, you can prepare fresh bread for you and your loved ones every day. Just get a recipe and use the pan as recommended for it. The best loaf pans allow you to prepare different types of bread depending on your needs and preferences. When you make bread at home, you will enjoy a healthy lifestyle. Unless you want a large ceramic mini loaf pan, which would be perfect for a professional kitchen, get a compact model that can easily fit into the average kitchen cabinet. 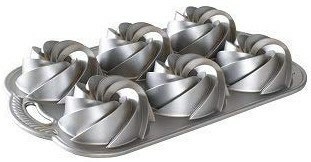 Go for versatile model if you would want to use it for preparing not just loaves but also other types of baked goods. 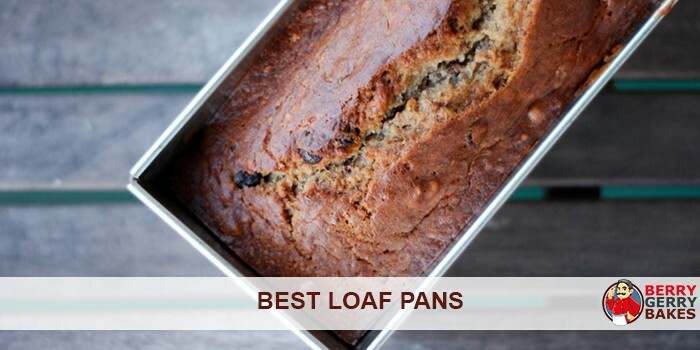 Which is the Best Loaf Pan? 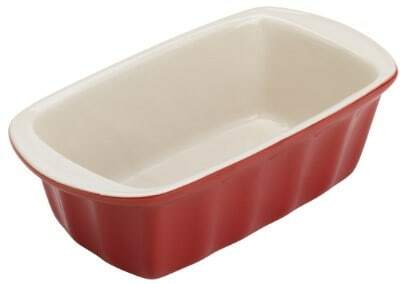 From our loaf pan review, it is clear that the USA Pan Bakeware Pullman Loaf Pan is the top bread pan. The pan is affordable, bakes loaves evenly and is durable.